Francis Scott Key’s words commemorate precise details of a specific event during the War of 1812. British forces had burned Washington in August of 1814, and captured a physician for whom Francis Scott Key had permission from President James Madison to negotiate his release. The doctor was freed but they were not allowed to return until after the battle. Scouts hold our flag, the flag of our country, in high regard. We open our meetings with the Pledge of Allegiance to our flag and the country for which it stands. We display it at our meetings and camps. We even wear it on our uniforms. The flag of our country is prominent in our Scouting program! Flags, in time, wear out. Unserviceable flags need to be respectfully retired. The Boy Scouts of America is one of a limited number of organizations that are authorized by congress to retire unserviceable flags. Tonight, we will retire an unserviceable flag. Color Guard, present the flag to be retired! Color guard takes a position behind the bonfire and displays the flag to be retired by unwrapping the flag and holding it so that the audience may see it. I am your flag. I was born on June 14, 1777. I am more than just cloth shaped into a design. I am the refuge of the world's oppressed people. I am the silent sentinel of freedom. I am the emblem of the greatest sovereign nation on earth. I am the inspiration for which American patriots gave their lives and fortunes. I have lead America's sons into battle from Valley Forge to the steaming, treacherous jungles of Vietnam to the hot arid sands of the Middle East. I walk in silence with each of our honored dead, to their final resting place beneath the silent white crosses -- row upon row. I have flown through peace and war, strife and prosperity, and amidst it all, I have been respected. My white stripes signify the burning tears shed by Americans who lost their sons. My blue field is indicative of God's heaven under which I fly. 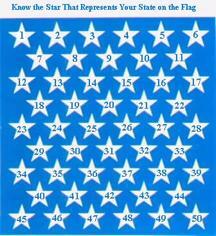 My stars, clustered together, unify 50 states as one, for God and country. "Old Glory" is my nickname, and I proudly wave on high. Honor me, respect me, and defend me with your lives and your fortunes. Never let my enemies tear me down from my lofty position lest I never return. Worship Eternal God and keep His commandments, and I shall remain the bulwark of peace and freedom for all people. All please rise. Hand salute. Color guard, for the last time, retire the colors. Color Guard places the unfolded flag on the fire. The salute is held until the flag is completely burned. Ready, two! Please be seated. This concludes our flag retirement ceremony. The stripes also have a designation by state – they represent the first thirteen states, starting at the top red stripe for Delaware, and continuing down with the last stripe representing the thirteenth state, Rhode Island. Do you open your meetings with the same flag ceremony? If so, this is just what you need! In an effort to improve upon the meaning of a flag ceremony, Scouting Magazine, over a period of four issues in 1969 and 1970, presented a series of opening flag ceremonies. UNLESS THOUGHT IS GIVEN TO IT, the Pledge of Allegiance to the U.S. flag can become boring, disrespectful, and slovenly to members of Scouting and the general public alike. In the January 1964 Scouting Magazine, Paul S. Chance of Los Angeles, Calif., told how this worried him. He included some short introductions to the flag salute to make the ceremony different and meaningful each time. Sequoia Council, Fresno, Calif., hitch-hiked on his idea and came up with a set of flag salute introductions for every week of the year. The introductions were printed up and distributed to service clubs, fraternal groups, and other organizations having the pledge of allegiance as part of their regular programs. The idea was well accepted and used throughout the council. With three patriotic days coming up where the U.S. flag will be used often—Memorial Day, Flag Day, and Independence Day—we should be doubly aware of the tradition behind the flag and our nation. Listed below are flag salute introductions for every week in the months of May, June, and July. Watch for other 3-month sets of these introductions in later issues. WEEK OF MAY 5. We have good government only when we, the people of the United States, play an active part in making it good. Let us salute our flag with that in mind. MAY 12. The greatest public document of the American people is the Constitution of the United States. Our flag represents our Constitution in action. Let us now salute the flag. MAY 19. Where our flag flies there is less oppression and more opportunity for self-expression. Will you now join me in expressing your allegiance to our flag? MAY 26. Red, white, and blue—the colors of our U.S. flag—mean many things to us as Americans. Let us give our own meaning to the colors as we pledge allegiance to our flag. JUNE 2. Thirteen stripes and 50 stars . . . this phrase can only refer to our U.S. flag. Let us remember the history behind the stars and stripes as we salute our flag. JUNE 9. On June 14, 1777, Old Glory, the flag made by Betsy Ross, was approved by Congress as the first official U.S. flag. In commemoration of that date, June 14 is now observed throughout our country as Flag Day. Let us remember this special day as we now pledge allegiance to our flag. JUNE 16. The pledge to our flag is more important than most of us make it. Let us show proper honor to our national symbol as we salute the flag. JUNE 23. "Long may it wave!" Let us remember the history behind this famous phrase as we pledge our allegiance to the flag of the United States of America. JUNE 30. On July 4, 1776, the Declaration of Independence was adopted by vote in the Continental Congress, thereby giving birth to a new nation. As we approach another Independence Day, let us pay tribute to our rich American heritage. Let us now salute the flag. JULY 7. Independence Day marked the <193d> birthday for our nation. As we salute our flag, let us vow to be good citizens during the coming year. JULY 14. As we salute the flag, let us remember the words from The American's Creed that ". . . it is my duty to my country to love it; to support its Constitution; to obey its laws; to respect its flag, and to defend it against all enemies." JULY 21. In the flag salute, there is no comma or pause after the word "Nation." The concept of one Nation under God is a precious thing. To weaken it with an unwanted comma is an affront to the patriotic heart as well as to the poetic ear. Let's say the pledge correctly. JULY 28. The red in our flag stands for courage and bravery. Today as we salute the flag, let us remember our men in the Armed Forces who are serving us and our country. THE MAY-JUNE ISSUE OF Scouting Magazine listed some different and meaningful introductions to pledging allegiance to the flag of the United States of America. Below are more such introductions, week by week, for August, September, and October. AUGUST 4. The U.S. flag is the emblem of our nation. . . . the leader of the free world. Let us now salute the flag. AUGUST 11. An active, patriotic citizenry is essential to preserve and strengthen our American heritage. Respect for our flag is part of this. Let us show it by saluting our flag today. AUGUST 18. Planted firmly on the high pinnacle of American faith, the U.S. flag has proved an inspiration to untold millions. Men have looked upon the flag as a symbol of national unity. Let us unify (as organization members) today as we repeat the pledge to the flag. AUGUST 25. So long as the principles of truth, justice, and charity for all remain deeply rooted in human hearts, our flag shall continue to be the enduring banner of the United States of America. Let us join in the pledge to our flag. SEPTEMBER 1. For more than 9 score years, our flag has been the emblem of liberty for generation after generation of Americans. Let us look at it with pride as we salute our flag today. SEPTEMBER 8. The flag flies before our eyes as a bright gleam of color and a symbol of ourselves. Let us join in saluting the flag of the United States. SEPTEMBER 15. The stars and stripes are our dreams and our labors. In these unsettled times, let us salute the U.S. flag. SEPTEMBER 22. Our flag is bright with cheer, brilliant with courage, and firm with faith. Let us add to this with a sincere salute today. SEPTEMBER 29. Our flag represents constitutional government designed to serve all the people. Let us remember that as we salute our flag today. OCTOBER 6. The wording of the pledge to the flag was drawn up in the office of The Youth's Companion in Boston ill 1892. It was first used in the public schools in celebration of Columbus Day, October 12, 1892. Let us continue the tradition of the pledge to the flag as we repeat it today. OCTOBER 13. To personally understand and maintain the American way of life, and to pass it intact to succeeding generations is the responsibility of every true American. Let us vow to do this, and think about it now, as we salute our flag. OCTOBER 20. Thomas Jefferson said "The God who gave us life, gave us liberty at the same time." As we repeat the pledge of allegiance, let us remember that our flag is a symbol of this precious liberty. OCTOBER 27. Because we are proud and appreciative of America's role in world leadership, let us now salute our flag. WHEN WE SALUTE THE U.S. FLAG, we should do it with sincerity and with appreciation, not just by rote. Continuing the series in the May-June and July-August issues of Scouting Magazine, here are more new flag salute introductions for November, December, and January. Use them at Scout meetings, church affairs, service club luncheons, etc. NOVEMBER 3. When you look at the flag, you can see the Constitution and the courts, the statutes and statute-makers . . . a soldier, a street-sweeper, a counselor, or a clerk. What do you see as we salute our flag today? NOVEMBER 1O. We live a changing life, a life of moods and passions, a life of heartbreak and tired muscles . . . but the flag stands fast. Join me in saluting our nation's flag. NOVEMBER 17. Our flag stands for all that we hope to be and have the courage to try for. Let us join in a salute to the red, white, and blue. NOVEMBER 24. The flag represents song and fear, struggle and panic, hope and joy. Join me in saluting the flag of our country. DECEMBER 1.<Twenty-eight> years ago this week the United States was drawn into a world war. In memory of Americans who died during that war and recent conflicts, let us join in a salute to our flag. DECEMBER 8. Webster defines the word "flag" as a light cloth bearing a device or devices to indicate nationality or party. Show your nationality during our flag salute today. DECEMBER 15. Thirteen stripes and 50 stars . . . representing the Original Thirteen Colonies and our 50 States of today. Today, as in 1776, our flag is a rallying point for all Americans. Let us salute our flag proudly. DECEMBER 22. Our flag has changed its form and design over the years, but it still causes patriotic feeling in Americans. Let us partake of this now as we salute the flag of the United States of America. DECEMBER 29. As we move into a new year, let us vow to renew again our faith and belief in our country . . . and let us also continue to salute our flag with feeling. JANUARY 5. Today, let us salute the flag in honor of our Founding Fathers who had visions of today's America. JANUARY 12. Join me in saluting the flag of our country, the emblem of truth and justice. JANUARY 19. When we realize what our flag stands for, it is with genuine enthusiasm we salute the flag of our country. JANUARY 26 Let us now salute our flag that represents over 200 million Americans in 50 States as if it represented us alone, led by ———. ACCORDING TO THE Bylaws of the Boy Scouts of America, the goals of the movement are character development, citizenship training, mental and physical fitness. Proper citizenship can't be taught without proper respect for our U.S. flag and our American heritage. In the May-June, July-August, and October 1969 issues of Scouting Magazine, a series of flag salute introductions was run to make the flag salute more meaningful. The salute introductions can be used at any gathering of American citizens, such as service clubs, political functions, or Scouts. Completing the series, here are flag salute introductions for each week in February, March, and April. FEBRUARY 2. When we salute our flag, we should place our right hands over our hearts. Let us do this as we now salute the U.S. flag. FEBRUARY 9. Because we are thankful and appreciative of such leaders as Abraham Lincoln, let us salute the flag and at the same time remember the great Presidents of our great land. FEBRUARY 16. We observe George Washington's birthday next week. As we salute the flag today, let us remember the Father of his Country and the heritage of America. FEBRUARY 23. Because we are proud and appreciative of America's role in world leadership, let us now salute our flag. MARCH 2. For the opportunities our country offers to the youth of America, let us now salute our flag, the emblem of our nation. MARCH 9. For those who died that this nation might live, let us now salute our flag. MARCH 16. We, the people . . . that's what our flag stands for. Let us salute the flag. MARCH 23. To secure the blessings of liberty to ourselves and our posterity is a challenge to all of us. Let us salute our flag. MARCH 30. In the folds of our flag are enshrined every ideal, hope, and opportunity made possible because someone has lived. Let us salute the flag. APRIL 6. The 31 words of the Pledge of Allegiance are among the best-known words in America. Let us repeat them now with meaning as we salute our flag. APRIL 13. 0ur State is represented one of the 50 stars on our flag. Let now pledge allegiance to our flag individuals and together for our State. APRIL 20. The flag of the United States of America is the emblem of our nation, the leader of the free world. Let us now salute our flag. APRIL 27. In peace and war our flag flies proudly because Americans are not forgetful of others. Join me in saluting our flag. Use the facts below, or others the boys have researched, to play a Trivia game. You could give each person, family or den a list and have them choose their answers – or post the answers and questions on the wall and have teams take turns choosing which answers go with which questions. The winners get a simple prize – maybe first turn at the refreshments, or a small American flag. This would also be a fun competition between all the boys and the parents. The colors of the flag stand for courage (red), liberty (white), and loyalty (blue). The blue field with it’s 50 stars is called “The Union” and stands for the union of the 50 states….The United States of America. George Washington’s original sketch for the flag called for a six-pointed star. The Ranger, commanded by John Paul Jones at Portsmouth, N.J., became the first ship to fly the American flag on July 4, 1777. The first American flag flown in combat at sea was on the Raleigh, commanded by Cap. Thomas Thompson on Sept. 4, 1777 when he attacked British shipping in the Atlantic. The first flag flown during ground combat was the Bennington flag, on August 16, 1777 at Bennington, VT. The first American flag to go around the world was carried by the Columbia, which sailed from Boston on Sept. 30, 1787 and returned on Aug. 10, 1790. The first time an American flag flew over a school was in Colrain, Mass. in May 1812. John Paul Johns ordered a British Man of War to strike it’s flag to the American flag for the first time on April 24, 1778. Flag Day was first observed at Hartford, CT. on June 14, 1861. Public schools celebrated Flag Day for the first time in Philadelphia on June 14, 1893. The first official resolution designating June 14 as Flag Day was on Aug. 3, 1949, signed by President Truman.